I love zucchini, really I do, but it is possible to have too much of a good thing. The zucchini are here with a vengeance. I’m picking several of them EVERY DAY at the moment. They can go from baby to giant in the blink of an eye if I am not careful, and while my friends, neighbours and family are still happy to take them, that can only last for so long before they start averting their gaze when I approach with armloads of runaway giants. 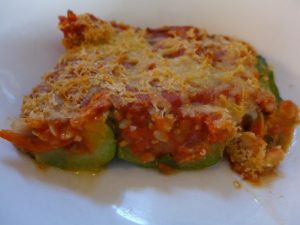 The zucchini are not really the star of the dish – the sauce and the ‘cheese’ are, with the zucchini being a fairly bland platform to hold them. But importantly, it uses zucchini. What more could you ask for when you’re drowning in them? It also has the advantage of using up the ever growing pile of cherry tomatoes of various colours that are starting to take over my kitchen. The dish ends up being like a lasagna without the pasta. Warm, soft and comforting. Just the thing for a day when we’ve had a cool change in Melbourne after days of unremitting heat and salads. Put them into a steamer and steam until barely tender but not too soft, just enough so you can easily scoop the centre out. In a large frying pan, heat the oil and add the onions and fry until soft, then add the garlic and fry for 30 secs. 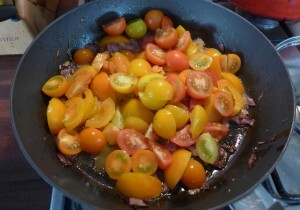 Add the chopped tomatoes and salt to taste and cook until they collapse into a sauce, add liquid if needed. I also give them a squash with a potato masher to hurry things along. 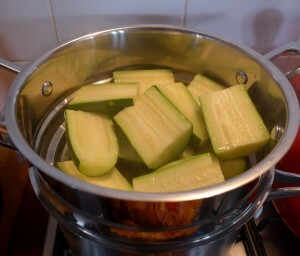 Remove the zucchini from the steamer, scoop out the centre seeds, chop the seeds and pulp and add back to the sauce. Arrange the zucchini cut side up in a baking dish. Season with some salt - not a lot. This is important otherwise the zucchini taste incredibly bland. Add the oats to the sauce and simmer for 5 minutes. Stir in the basil and check the seasoning. Scoop the sauce into the zucchini shells, there should be enough to fill them and cover them completely. Don't use the really monster zucchini, they are too tough. The skins need to be still tender and shiny. Once the skins harden and go dull they are no good for this recipe, or much else either!